Thanksgiving will be over as quickly as it arrives. But this year, you don’t have to ask yourself, “What am I supposed to do with all of these leftovers?” Many families cook a feast for the friends and relatives invading their homes. As a result, they end up with enough leftovers to feed an army. Let’s face it; even if you plan ahead, there’s still a chance you won’t manage to eat all of your Thanksgiving dinner. 1. Buy only what you know you will eat. It’s hard to guess how much food will actually be consumed at your dinner table but if you take the time to estimate, you will save yourself some money and lessen your chances of ending up with too many leftovers. See how many people are coming to Thanksgiving dinner and plate your food. If your aunts and uncles aren’t serving themselves, you’ll have a better idea of how much to make. 2. Check the clearance section at your grocery store. While shopping for the troop of hungry people that will be sitting at your table, check the clearance area at your grocery. Not only can you save money by purchasing these marked down items, you’ll be saving them from making their way to a landfill. Next year, you can use the app FoodLoop, which is in development to help consumers find clearance grocery items. FoodLoop will allow you to make a grocery list so it can notify you when one of your items has been marked down at your local grocery store. 4. Help a charity spend less on Thanksgiving dinner. If one of your family traditions is to spend part of Thanksgiving serving dinner to the less fortunate, check into apps such as Food Cowboy for the charity’s produce supply. Food Cowboy connects produce shipments that have been rejected for aesthetic reasons to various charities to prevent them from getting tossed out. 2. Freeze your excess leftovers. 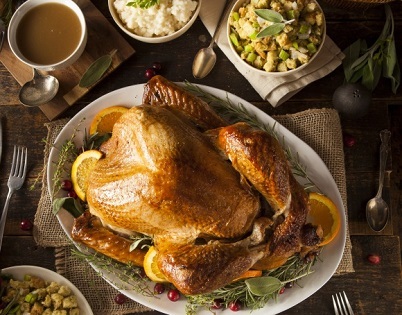 You may be sick of stuffing and turkey now, but in a month or two you are going to be reminiscing about how delicious that Thanksgiving meal was. Freeze your leftovers to preserve them for a nostalgic revisit to Thanksgivings past.You can even plan ahead by choosing recipes designed for freezing from sites such as Bowl of Delicious. 3. Create new meals with your leftovers. Being creative with your leftovers isn’t as hard as you’d think. Open your fridge and shop there, considering different combinations to revamp what you didn’t eat on Turkey Day. There are even websites such as BigOven that will help you find ways to repurpose specific leftover ingredients so they don’t end up in a landfill. 4. Send your uncooked leftovers to someone in need. Did you buy the Costco variety pack of stuffing? Organizations such as City Harvest will take a lot of those packaged goods that you didn’t get to and donate them to people who weren’t fortunate enough to have a fancy Thanksgiving meal. It will also take prepared foods that weren’t served, so if you ordered from a catering company and didn’t touch a tray or two, send it over so the food can brighten someone else’s day. 5. Donate leftover produce to AmpleHarvest.org. Did your garden grow 25 extra squash that you can’t use? Chances are your friends won’t take any more, so what do you do with the leftovers? AmpleHarvest.org is a resource for everything pertaining to fresh produce donations. It is a national service, so no matter where you live, you can register, download its app and find out where to take that leftover produce from your garden so it doesn’t go to waste. Also, think ahead about your table centerpiece this year. AmpleHarvest.org’s Centerpieces for Pantries program encourages people to swap out a flower centerpiece for fresh produce so it can be donated after the holiday! 6. Download a food waste app. Accidentally buy too many potatoes? Believe it or not, there are apps to help you donate all that Thanksgiving food that didn’t make it to the dinner table. Apps such as CropMobster have been designed to connect consumers with what would previously have ended up getting thrown out. Assess what you didn’t cook, then post it with this app for those who could make use of it. This new approach to leftovers is increasing in popularity with the development of similar apps such as SpoilerAlert. 7. Post your leftover Thanksgiving meal to LeftoverSwap. LeftoverSwap.com is a network for people who can’t finish their meals and people who want to eat them. All you have to do is download the app, take a picture of all that turkey and stuffing you couldn’t eat and wait for someone to respond and arrange a pick up. 8. Donate your scraps to a zoo or farm. Believe it or not, some zoos and farms will take your leftovers to recycle into animal feed. Check your local zoo or search for farms that allow scrap donations. Pig farms will typically take your scraps because pigs generally eat anything, including mashed potatoes and stuffing.